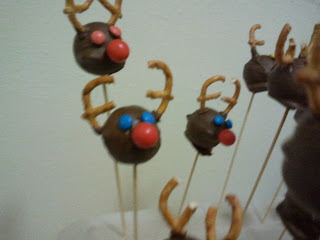 Pippi In The City: Pippi's Piece - Rudolf Reindeer Cake Pops - Woo Hoo!!!!! 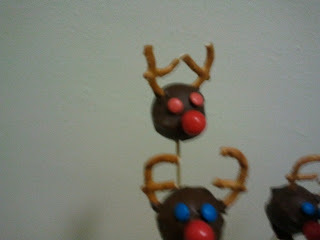 Pippi's Piece - Rudolf Reindeer Cake Pops - Woo Hoo!!!!! 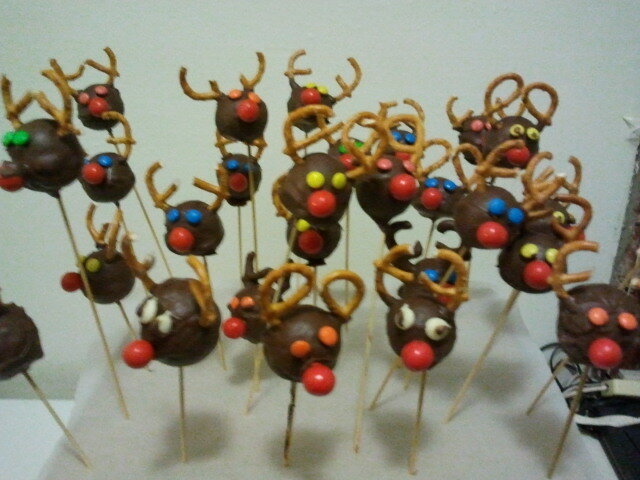 This year for the children's school end of year Christmas parties, I made Rudolf Cake Pops!!! They were fiddly, but they were really fun to make (albeit a little frustrating at times!!) I guess they did take some time, but I did them in stages, so it didn't seem that bad. First I made the cake pop balls. I used a simple cake recipe and I have a silicon Cake pop mould. 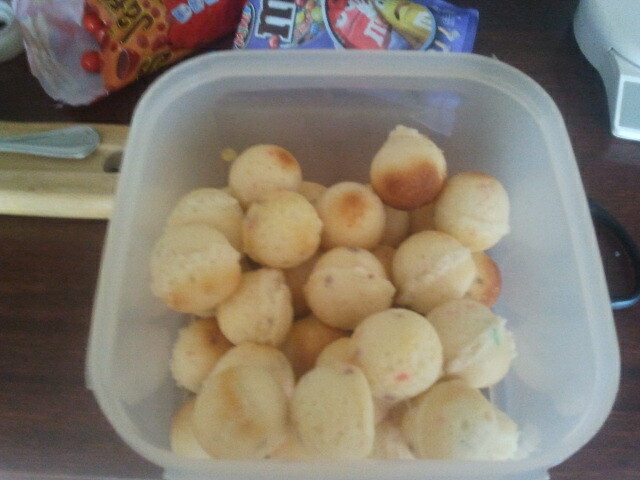 I made the cakes and then put the little balls in a container in the freezer. When I was ready to make the reindeers, I took the cake balls out of the freezer and left them defrost. I then used some Nestle Milk Melts and I melted them in the microwave for about 30secs at a time on medium heat until the chocolate was melted with a smooth consistency. I then placed the bowl over another bowl filled with hot water. 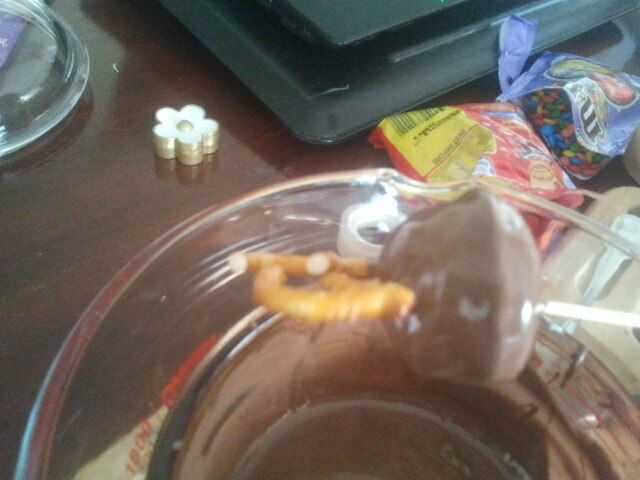 That kept my chocolate from setting too quickly. 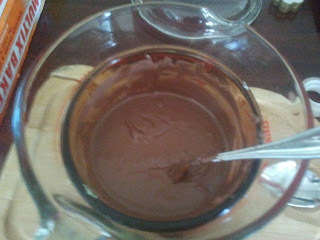 But be sure not to get any water in the chocolate, as that causes the chocolate to turn & is then no good. 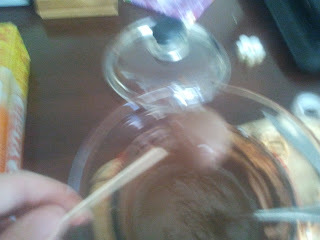 Next I dipped a wooden skewer into the chocolate and then into the cake ball. I left the chocolate set. 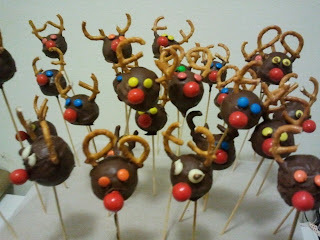 I placed a cardboard box upside down & put some baking paper over the top Then I just poked teh skewers through the box. 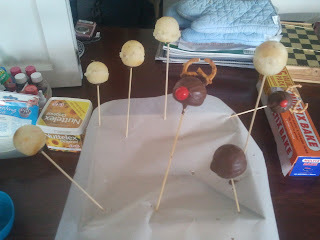 This was ok as a temporary measure, but the heavy balls on the skewers made the skewers lean over & that is why foam is much better, as the skewers then stand upright and the cake pops don't bang into one another. Next I dipped each cake ball into the melted chocolate to cover it. Then I poked the pretzels into the top to form the antlers. In Australia, I couldn't seem to find the right pretzel shape like many of the USA sites show. Instead I bought pretzels and then cut them in half and trimmed a little of the top to make the shape. Finally you dip the edge of a Jaffa lolly into the chocolate and stick on a nose, and then do the same with 2 m&m lollies for the eyes. As you can see in the picture above, I also tried using white choc chip pieces for the eyes. 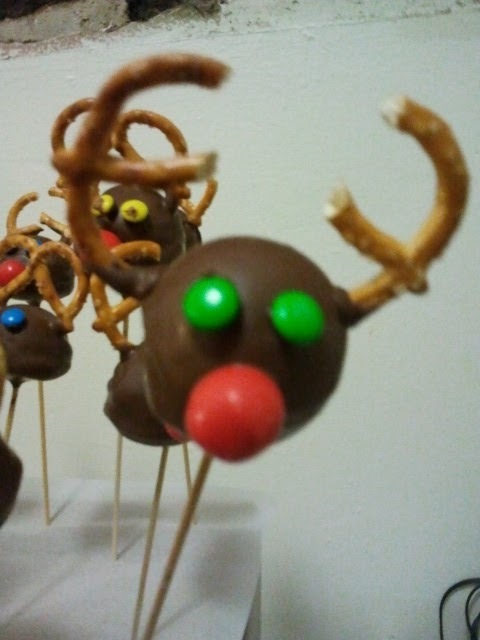 I then dipped the pointy end bit into the melted chocolate to give the eyeball look. However, I liked the m&m eyes better and found it less time consuming. You can also see that each one has slightly different antlers. Finally I ran out of room in my cardboard box arrangement and I was running out of time to get them done before class party. 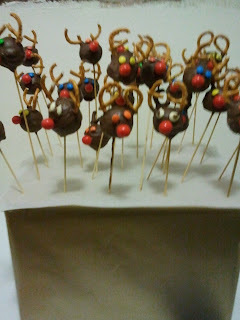 So I placed a cooling rack over a plastic jug & started dangling the reindeers in there. You can also see in the above picture, I tried dipping a few in the chocolate with the antlers on. However I found that the antlers didn't stick as well straight into the cake, and if I re dipped them all after the antlers it used a lot more chocolate and took a lot longer. Plus the pretzel colour makes them look more like antlers in my opinion. The kids - ABSOLUTELY adored them. My son was SO excited to be taking them into the class party. When he thought that I wouldn't get them finished in time, ( I had dipped all the balls on skewers, but I hadn't put the antlers, eyes or noses or yet ) he woke up in the middle of the night, and started finished a whole lot of them off for me. It can be fiddly, as you need to hold the noses on until the chocolate sets enough to hold it. So the chocolate needs to be melted, but not too hot and runny. But I think it was well worth it, seeing the eyes on all those little children's faces!!!! 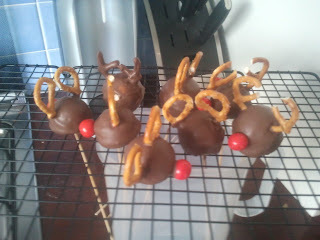 We also made Ruldolf Reindeers with Arnott's Chocolate Royale Biscuits, and Santa on his sleigh from Milkyway bars. I will post those up here soon. I know it is too late for this Christmas, but at least you will have some ideas for next Christmas now!! 1st Birthday Party - Comments or Suggestions??? ?